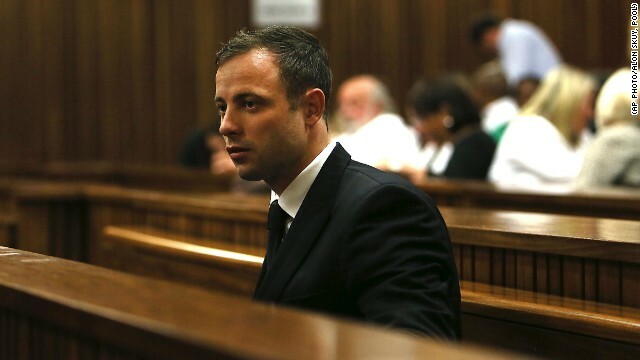 Oscar Pistorius is found guilty of culpable homicide in a South African courtroom. Oscar Pistorius is guilty of culpable homicide. An escaped school shooter is back behind bars. And ISIS is a whole lot bigger than we first thought. Convicted: A judge has found Oscar Pistorius guilty of culpable homicide, the South African term for unintentionally - but unlawfully - killing a person. The verdict comes a day after Judge Thokozile Masipa cleared Pistorius of murder in the killing of his girlfriend, Reeva Steenkamp, but he could still end up behind bars. The customary maximum prison sentence for culpable homicide is 15 years, but a typical sentence is five to eight years, said Kelly Phelps, a CNN legal analyst. Sentencing could be weeks away and will come after more legal argument. Back behind bars: T.J. Lane, a remorseless killer who escaped from an Ohio prison where he was serving three life sentences for a school shooting, has been captured. For six long hours, police scoured neighborhoods on the north end of Lima, asking residents to lock their doors and stay inside. They brought in extra officers and provided patrols to the families of Lane's victims. In the end, he was found 100 yards away outside a church, the prison warden said. He didn't say anything, nor did he put up a fight, authorities said. Helpful, or not? A new video in the Michael Brown shooting could be a "game changer" in the way a grand jury handles the controversial case, legal experts say. First of all, it shows witnesses who are white and don't live in Ferguson, Missouri. Most of the grand jury is white and may better relate to them. Second, it shows their reactions shortly after the shooting. And third, their observations echo other witness descriptions. Still, the new video doesn't show the shooting, is just part of a vast amount of other evidence, and the witnesses didn't see how it all started. It could take months for the grand jury to reach a decision on charges. Numbers game: ISIS is a lot bigger than we first thought. A new assessment says the terror group "can muster between 20,000 and 31,500 fighters across Iraq and Syria," a CIA spokesman said yesterday. Analysts and U.S. officials initially estimated there were as many as 10,000 fighters, including those who were freed from prisons by ISIS, and Sunni loyalists who have joined the fight as the group advanced across Iraq. The news came a day after President Barack Obama laid out his plan to "dismantle and ultimately destroy" ISIS, including authorizing airstrikes. Taken to task: The mother of James Foley, an American journalist beheaded by ISIS militants, said she is "embarrassed and appalled" by how the U.S. government dealt with her son's case. "I think our efforts to get Jim freed were an annoyance" to the U.S. government, Diane Foley told CNN's Anderson Cooper in an interview that aired Thursday. "It didn't seem to be in (U.S.) strategic interest, if you will." Foley says the U.S. must find a way to negotiate with terrorists. - Bachelorette video: Instead of a girls' weekend in Las Vegas, this woman decides to make a music video to celebrate her upcoming wedding. It's also bilingual. - Luna the dog vs. Bear the cat: This is exactly why cats think dogs are stupid. - Taylor time: A daddy-daughter dance-off to Taylor Swift. - Bearly on course: Some young bears take over a hole in British Columbia. I've shed enough tears this week with all the misery and sadness going on in the world. The daddy- daughter dance and the bear on the golf course made me smile again. Thanks CNN TEAM. Have an enjoyable, beautiful and safe weekend!!!!!!! !